Aim and cover troublesome spots. 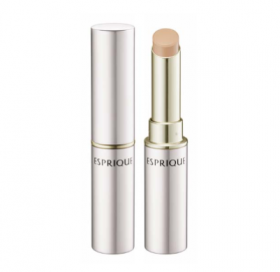 Stick concealer that resists smudging or fading. Covers under-eye circles, age spots, freckles, uneven color and blemishes! Stick concealer that resists smudging and fading. Virtually bonds to skin in a thin and smooth layer, creating a natural ﬁnish. Smooth texture spreads evenly without missing a spot, staying strong against sweat and sebum. Choose from 3 colors to match different skin tones. Use before powder foundation, or after liquid foundation and BB/CC creams. Twist to extend about 3mm of product and apply directly to troubled spots, then blend into surrounding skin with the tip of a finger.